This article covers the history of the point spread in sports betting as well a reverse line move and how to spot a reverse line move. For more than 100 years, sports betting has been around. The game was totally changed in the 1940’s when the point spread was introduced by Charles McNeil. The original point spread was supposed to be a split spread, where sports bettors could take the favorite -7 or the underdog +5, and McNeil understood that to make a good amount of money, the favorite would have to win the game by five or seven points. As the favorite sports bettors would push on a game decided by seven points, the underdog bettors would lose. Just as the underdog bettors would push when the favorite won by five points and those who bet on the favorite team would lose the bet. If the team that was favored happened to win by exactly six points, anybody who bet on the game would lose their bet, so early point spreads were created by attempting to estimate how many points one team was better than the other. The point spread popularity quickly caught on and soon, sports bookies around the world were offering it, in comparison to the moneyline style of betting that had been in place prior to. Competition among sports book and bookies saw the split-line come to an inevitable end, and so there was just one number posted with negative odds, typically at (-110), which is still the case in today’s sports betting age. After the spread was changed to a single number, sports bookies saw that they could only guarantee themselves a profit if the betting was about equal for both sides, and so the point spread changed from being a true predictor of how much one team was better than the other to being a tool that made two teams equal in the eyes of the bettors. This is a key fundamental lesson for any sharp sports investor, as the actual posted point spread is more of a gauge of public and professional opinion than an actual representation of the predicted outcome of the game, which in turn creates inefficiencies. This in turn creates situations where we will see what is termed a reverse line move – covered next. One well known story about point spreads occurred after the New York Jets beat the Baltimore Colts as 17-point underdogs in Super Bowl III. Oddsmaker Bob Martin was asked if he was embarrassed by his line and he stated that it was one of the best numbers he had ever come out with, as it created some serious two-way action. In the world of sports betting today, the point spread is best described as a handicap imposed on one team to help the sportsbooks attract the same amount of money on both sides of a game. Because there are a lot more people who bet on football than on something like college basketball, there is quite a bit of difference in the thinking that goes into the point spread. In college basketball, the line isn’t created to make two teams equal in the eyes of sports bettors as much as it is to beat the wise guys, who are capable of betting much more money than the average sports bettor. Football is totally different in that the number of bettors makes it possible that the “public” can wager more money on a side than the wise guys, even though the general bet size by the wise guys is going to be a lot larger than the average bet placed by the casual bettor. Understanding this concept can be beneficial to bettors when studying line moves and trying to determine why they have moved and what the number is likely to do in the future. Spotting a reverse line move can help you decide when to place a bet, and which side the “smart money” or “wise guy money” is on. What Leads to a Reverse Line Move? After a number is released by the sportsbooks, it will generally change because of one of four different reasons, two of which leads to the situation where you will see a reverse line move. The first reason is based on the amount of money that is coming in on one team is much more than the amount being wagered on the other. If 75% of the money being wagered on the Atlanta at Green Bay game is coming in on the Atlanta-9.5, the sportsbook will likely move the game to Green Bay + 10 to try and attract some bets on the Packers. This is expected and completely normal and has nothing to do with a reverse line move. Who is doing the betting would be the second reason. Regardless of popular belief, sportsbooks don’t mind regular winners, especially if they happen to bet early and wager fair amounts. There are some sports bettors online and in Las Vegas who can move an NFL line with a $440 bet, while another better somewhere else could wager $7,700 on a game and the line won’t budge. Sportsbooks aren’t afraid to shade the line a bit if they think it will have them on the same side as somebody who is a constant winner over time. One famous sports bettor who can move the line is Billy Walters from the famed computer group who won millions from Vegas sports books over the years. These days Walters spends his weekends at the Sports Book at the M Casino in Las Vegas, one of the few Sports books that will still take his action. A bet from Billy Walters can create a reverse line move. Another common reason for an online sportsbook to move its line is simply because one of the larger sportsbooks moved theirs. Some Sportsbooks hire people who keep track of what the other sportsbooks are doing and when the others are moving the Patriots from -13 to -14, the other sportsbooks will follow suit. This is often monitored electronically these days, this situation can be an indication of a reverse line move, but may require additional research. The last reason is due to a late injury, suspension or weather-related factor, such as Florida State sitting Jameis Winston for a half against Clemson or a game played in a December snowstorm. Here, the line will move based on how the sportsbooks believe people who are betting will react instead of waiting for them to react. When Winston’s first-half suspension was announced to , the Florida State line moved from -19.5 to -16.5 or 17 instantly because the sportsbooks thought people would take Clemson+19.5. This can creates a situation that looks like a reverse line move, but is definitely not one. With lots of different sites available which includes a large number of sportsbooks that are showing public betting percentages, sports bettors can dig into line moves closer than before these sites were available. To look up public betting percentages you can check Vegas Insider or my personal favorite is the Sports Insights iPhone App. For example, when 75% of the bets are coming in on South Carolina over Vanderbilt, there is no surprise about it when we see the line move from South Carolina -20 to South Carolina -22. It is expected because there are so many more people betting on South Carolina. Sports bettors should be on the lookout for when the line moves in the opposite direction of what is expected based on the public ticket percentages. For example of the Missouri Tigers opened -15 over the Indiana Hoosiers and according to the public betting percentages, more than 80% of the bets have come in on the Missouri Tigers, yet the line has dropped to Missouri -13.5. This means that the 20% of bets coming in on Indiana account for so much money that the sports books need to re-balance their books, by moving the number down to +13.5 for Indiana. What is a Reverse Line Move? A reverse line move is an indication that either somebody that the sportsbooks respects is on Indiana – for example a guy like Billy Walters, or that the bets that are coming in on the Hoosiers are much larger than the bets coming in on Missouri. This creates a reverse line move, where the line moves the opposite way of the public betting percentages. These larger bets are known as “Sharp bets” or “Wise Guy” bets. The fact that the bets are much larger, usually indicates that the money is coming from professionals who believe they have an edge in the game. This isn’t a reason to bet on Indiana by itself, but if you like Missouri it would be well worth your time and money to give the game one more look to see if there is anything you might have missed that the professional bettors may have caught. It is a definite look- ahead situation, but that probably isn’t enough to move the line 1.5 points. Giving your bets a little more inspection is never a bad thing, especially when it looks like you’re going to be on the other side of the big money. If you have any doubts about the game that is about to be played, don’t hesitate to pass, as that is the single biggest advantage sports bettors have over the sportsbooks. While the sportsbooks must post a line on every game played, the bettor is allowed to pick and choose which games they wish to bet on. 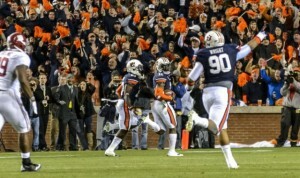 An example of a reverse line move that resulted in a correct prediction was the 2013 Iron Bowl, which had one of the most dramatic finished in College sports history. The line for the 2013 Iron Bowl opened with the favorite Alabama -9.5. As you can see in the chart below, the line held at -9.5 for several days with about 75% of the public or betting tickets on Alabama at -9.5. On about November 27th something interesting happened, the line dropped from -9.5 down to -8.5, even with the majority of the tickets on Alabama. This is a clear indication of a reverse line move. This was likely the result of some very large bets coming in on Auburn at +9.5. As you can see the new odds at -8.5, only further increased the number of betting tickets being issued on Alabama, which grew to about 75% by the time betting closed, when you see this happen, you know you have a reveres line move on your hands. In the image below, the reverse line move takes place when the point spread drops from -9.5 to -8.5 as indicated by the green line. The exact point of the reverse line move is where you see the $ sign, this is likely indicative of a very large bet or series of large bets on Auburn. Note – the above graph is available from Sports Insights along with their sports handicapping software, which I consider to be some of the best in the business, the software can definitely help you spot a reverse line move in action. For anyone who doesn’t know the outcome of the 2013 Iron bowl, you should check out the video below, as it was one of the most dramatic finishes in college sports history. Alabama was about to kick a game winning field goal on the last play of the game, when they missed and Chris Davis returned the kick over 100 yards for a game winning touchdown. 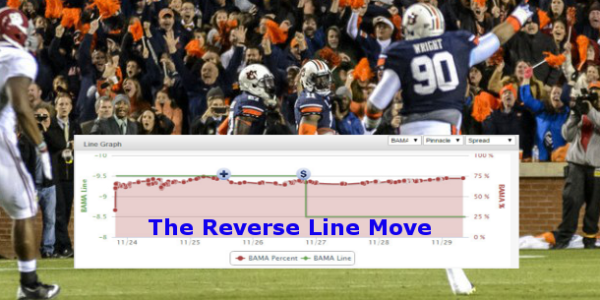 Even if Alabama had made the field goal, Auburn would have still covered the spread, and the Wise Guys or 25% of the betting public with tickets on Auburn would have still been right, and the reverse line move would have indicated the correct winning side. Another situation involving the same logic on a reverse line move is when you see over 80% of the pubic money on a specific team, but the line stays put, even on game day. This is often an indication that the sharp money or wise guy bets are on the opposite side of the public, so their bets are keeping the sports books balanced. This applies more often to early season NFL games and some prime time or big college games. Be very careful using this strategy with playoff games or bowl games that are posted well in advance. The chances are the sports books will wait until closer to the game day to adjust their lines, as they don’t want to give bettors opportunities to make covered spread bets or middles. So lets say you spot a reverse line move… now what? Well the first thing you should do is shop around to see if all of the sports books have adjusted their lines, this isn’t always practical if you are betting in person in Las Vegas, but it is very easy to do if you are betting online. Line Shopping is an absolute must for any serious sports investor. I recommend having accounts at several of the most reputable online sports books. The big online Sportsbooks like Pinnacle or 5Dimes usually have their lines all set the same, but there are rare occasions where you will find an off market line that hasn’t moved yet. There are also a few sports books that regularly offer off market lines. One example would be Bovada (USA) or Bodog. I often find situations where they are slow to adjust their lines, giving me an opportunity to wager on a very soft line, where I have already seen a reverse line move. In the end, it all comes down to research and discipline, you need to follow the smart money, but also make sound bets following a sound money management system. I hope you enjoyed this article on this history of the point spread and reverse line moves, as always feel free to leave your comments below. I am always interested in hearing feedback, questions or suggestions for additional articles. If you enjoyed this article and want to support Best Free Sports Picks please consider using one of our links to open an account on one of our recommended sports books. You get the best bonuses and you help support the best free sports handicapping resources.